What’s the slip ring? How does it work? Obviously, we need firstly to know about the operation principle and internal structure of the slip ring. There is more than one name for the slip ring. The slip ring, also called electrical slip ring, collecting slip ring or rotary joint, which is a kind of specialized rotatable connector and a kind of component that can transmit power and signal. The slip ring itself has no ability of revolving. The slip ring is made up of rotor and stator. The part, which connects the revolution part of the applications and rotates along with them, is called rotor. Oppositely, the part connecting the fixed structure of the applications is called stator. The design structure of stator and rotor is a kind of unipath overlay. The number of circuits is designed by request of utilization. During the process of assembling, the circuits of stator should be correspondingly aligned with the circuits of rotor. So the band-pass circuits between the stator and rotor come into being. Among every band-pass circuit, the electricity should be independent of one another. The formation of the band-pass circuits proves that there must be the connector between stator and rotor. 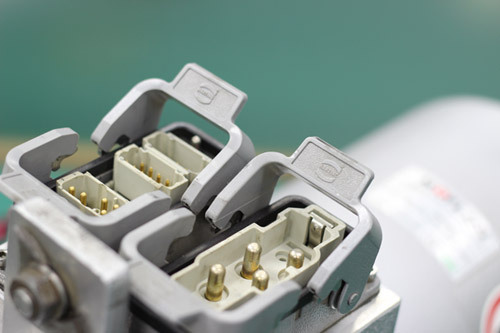 The connector is the key functional part of the slip ring. At the same time, it is also a carrier embodying the overall system performance of the slip ring. Hence, it is very strict for the selection of the material and designation of the connector. Besides, in order to establish a stable and reliable connecting system for rotary, each part of the slip ring should cooperate with each other. When attached to rotating equipment, the slip ring could transfer various types of signals through the cables attached to both ends of the slip ring.